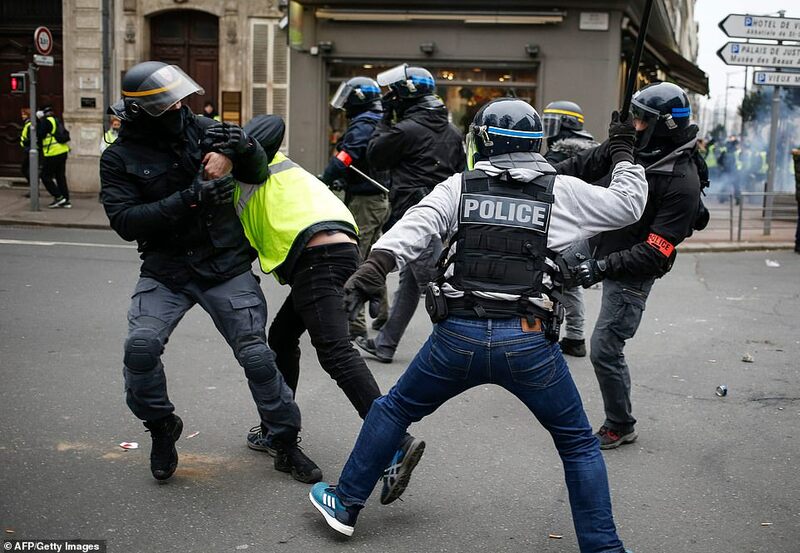 Violence erupted in Paris today as anti-government ‘Yellow Vest’ protestors for President Emmanuel Macron to resign for the eigth Saturday in a row. 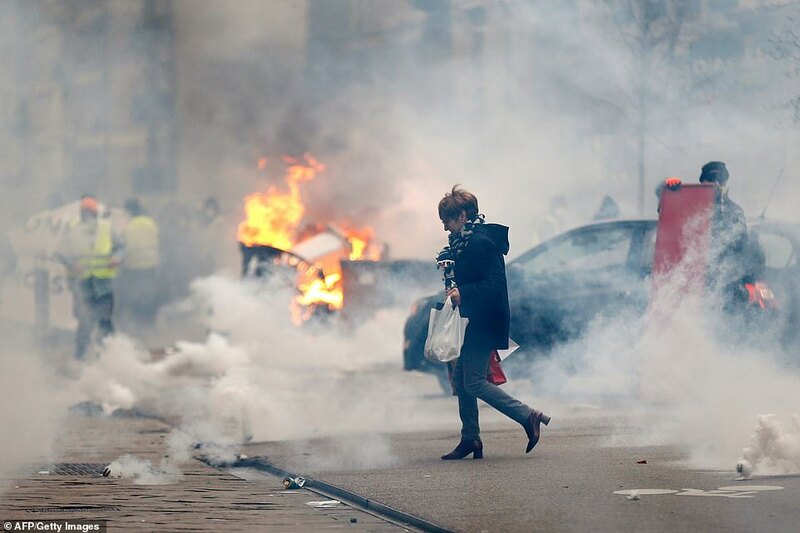 Teargas and batons were used by riot police on a so-called ‘Act VIII’ Day of Rage organised by the Yellow Vest movement. 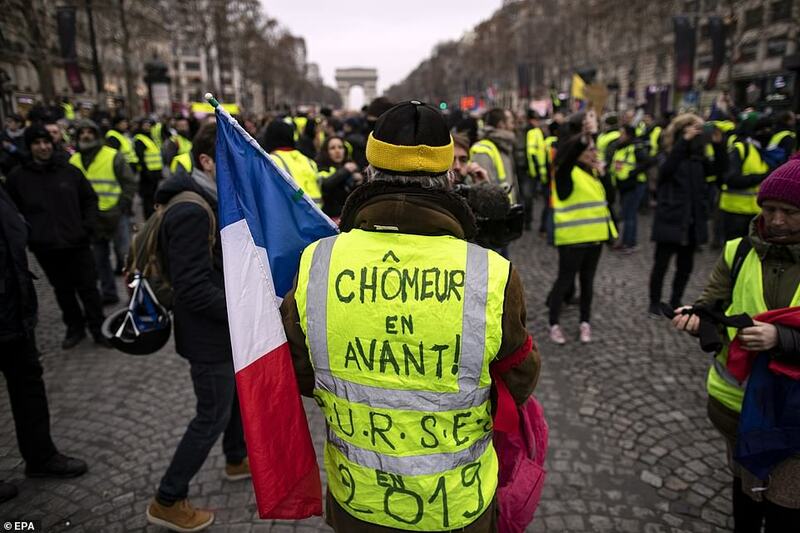 Marches were underway in several other cities across France. It followed the arrest the 33-year-old Eric Drouet, one of the group’s most high-profile leaders, on Wednesday night. 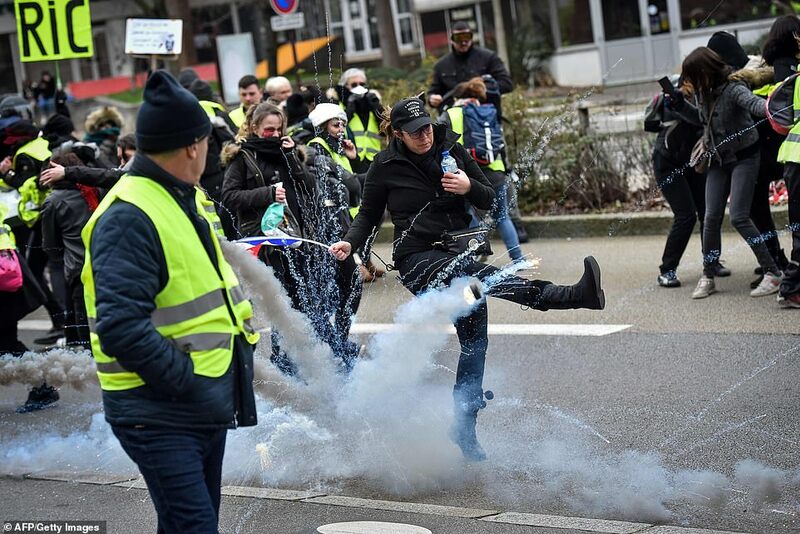 Today, there was trouble around the River Seine, where police unleashed gas and flash balls at a crowd of around 2000 Gilets Jaunes. All were attempting to march on the National Assembly, the French parliament, but were held back. This led to fighting on the foot bridges crossing the river. 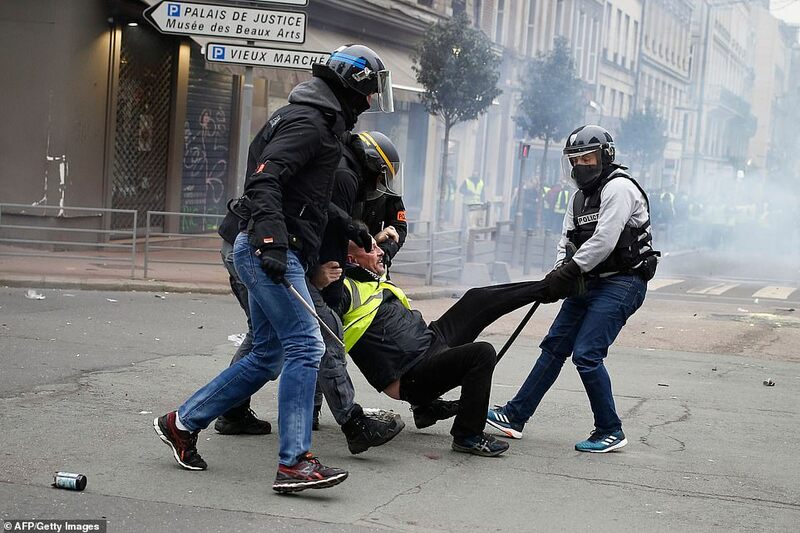 Ten members of the movement have died at blockades organised at major roads around France, while hundreds of others have been injured in rioting. 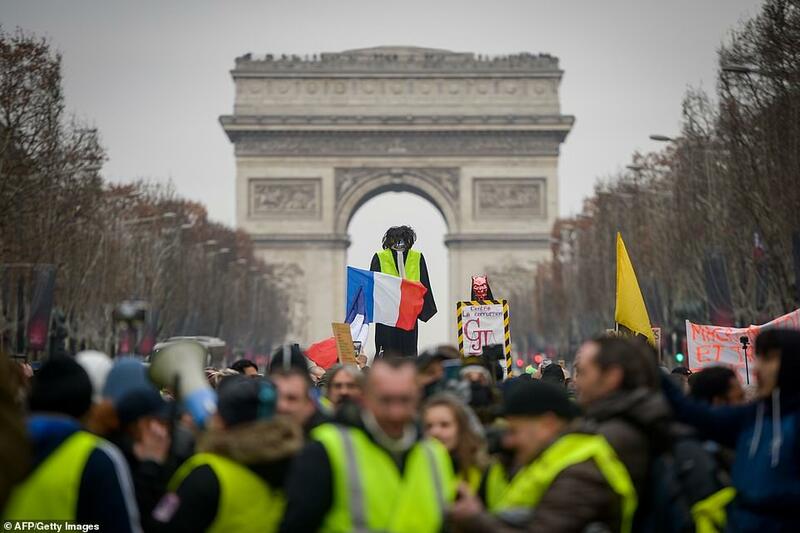 The Vests have been protesting since November 17 and, despite a range of concessions by President Macron including scrapping green taxes of diesel and petrol, continue to call for him to step down. 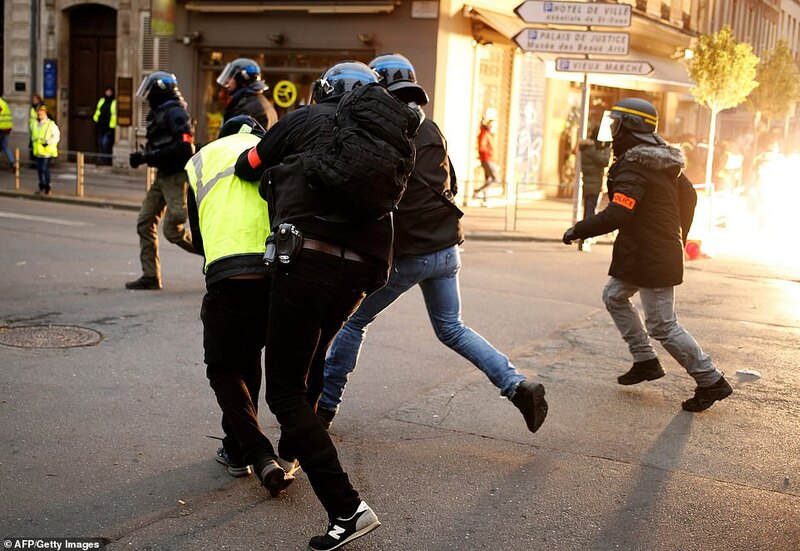 Many have been arrested, including some 700 who were held in custody on a single day in Paris in December. High-end shops including luxury fashion boutiques were today boarded up in Paris, along with banks and post offices. This follows major acts of vandalism, including the Arc de Triomphe itself being attacked. 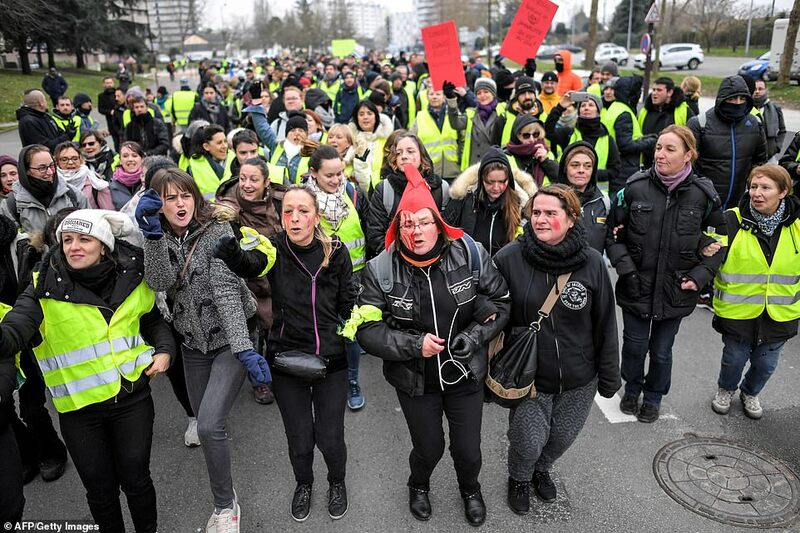 On Friday, government spokesman Benjamin Griveaux denounced those still protesting as ‘agitators who want insurrection and, basically, to overthrow the government’. 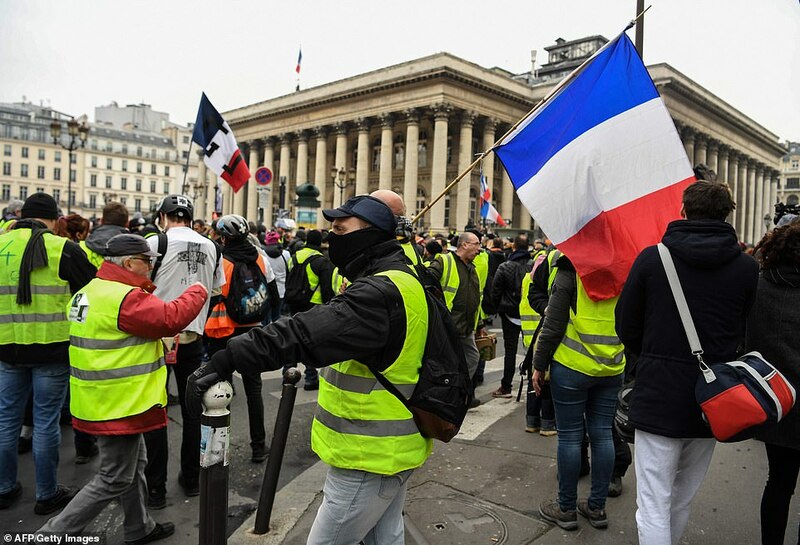 In Paris, organisers called for a march from the City Hall to the National Assembly (parliament) building, and a rally on the Champs Elysees, the scene of violent clashes at previous demonstrations. 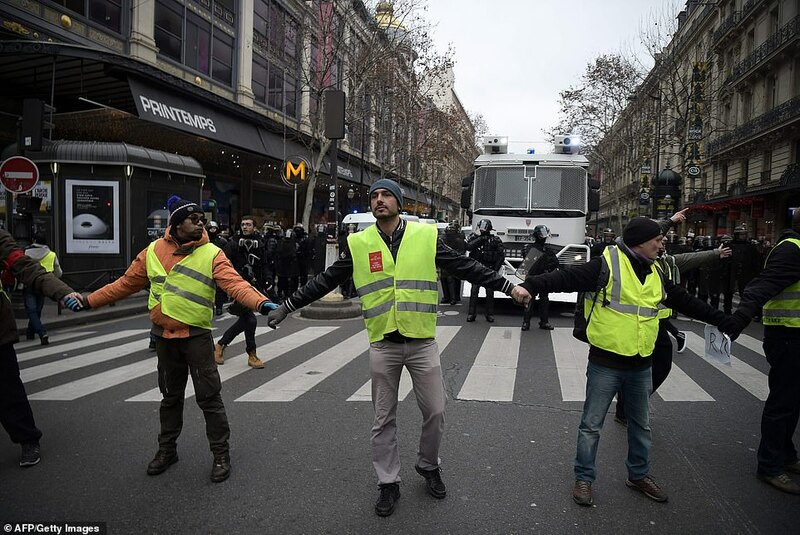 The latest opinion poll, published on Thursday by Odoxa Dentsu, indicated 55 percent public support for the ‘yellow vest’ protests. Mounted police, water cannons, and 14 armoured vehicles capable of spreading high-intensity gas were today all on standby as part of the security operation. They have failed to prevent widespread disorder over the past few weekends, with the worst violence normally coming at nightfall. 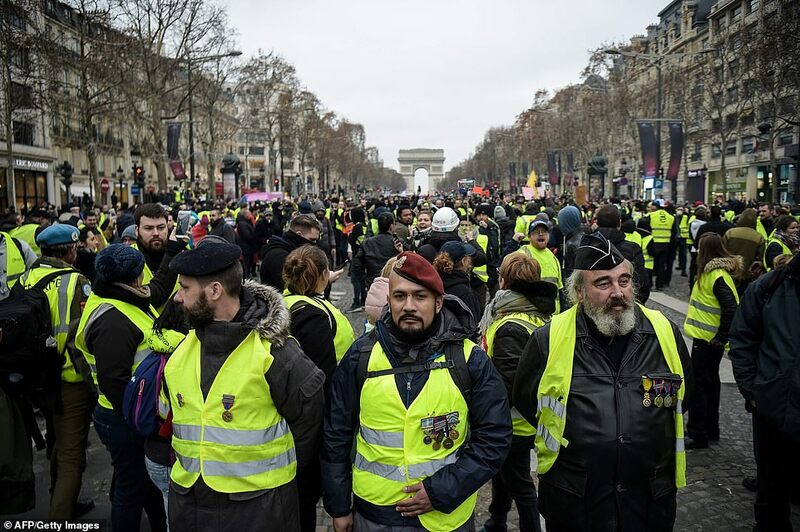 The Vests have been joined by extremists from the far Right and the ultra-Left, as well as anarchists intent on causing as much damage as possible. 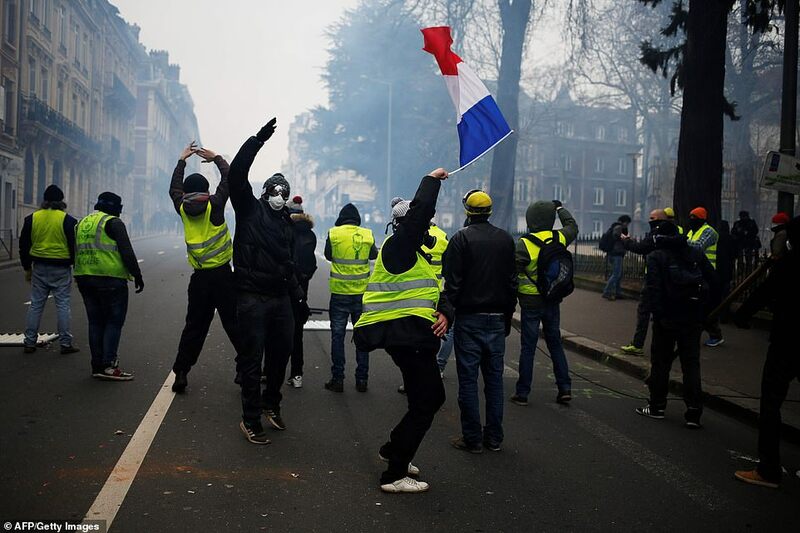 The ‘yellow vest’ demonstrations – named after the high-visibility jackets worn by the protesters – began in rural France in November over increased fuel taxes. Crisis-ridden Mr Macron has not only climbed down on imposing green surcharges, but increased the national minimum wage by seven per sent, and scrapped tax on bonuses. 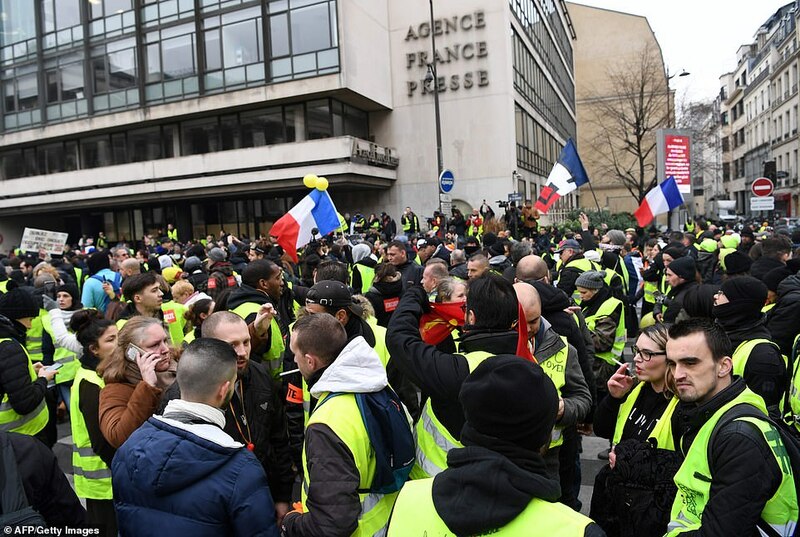 But the Yellow Vests said their protests would continue indefinitely as they campaign for even more concessions. The independent Mr Macron, leader of the Republic On The Move party, won the French presidential election in a landslide in 2017, but he is now dubbed the ‘President of the Rich’ with polls showing his popularity rating down to just 18 per cent.